This is not a food blog, so I've been hesitant to share recipes without the required two-dozen professionally styled photographs and step-by-step visual guides. I have exactly two pictures and two simple recipes. I can provide you links to some guides if you need... guidance. Otherwise, please just take the information and have fun. Cooking, to me, isn't really about making anything perfect. I just enjoy taking some time and love to feed myself and my family. Whatever you end up with is fine, as long as it's not somehow filled with toxic chemicals. I did not include any toxic chemicals as ingredients below, so I think we should be okay? The pop tart is better than store bought insomuch as it doesn't taste like it's been in a box for three years. If I'm eating chocolate for breakfast, I want it alongside a cup of coffee. Why not make it taste like coffee, too? "More coffee, better meal," is what I always say to myself as I pour my sixth cup of coffee for the day. The toaster strudel is akin to a danish, my favorite breakfast treat. It's equal parts buttery, flaky, crispy, tart, creamy and sweet. SHUT UP right? I like the pop tarts okay, but you're going to have a hard time forcing me to stop making these pastries every day. I will quit everything else in my life to make and eat these. I will let these rectangles of butter and jam ruin my life. Someone get me pre-registered for a diet program, thanks. one 3 or 3.5oz good quality chocolate bar, broken (like your comfort-food craving heart) into little pieces. 1. Combine flour, salt, cinnamon and cardamom in a medium mixing bowl. Whisk until blended. 2. Using a box grater on the largest grate (like what you'd use for cheddar cheese), grate the butter over a cutting board and use the paper wrapper to hold the stick and protect your hand. Add grated butter to the dry mixture and toss with a fork until butter is evenly coated and incorporated. takes 2. Whatever. Before the mixture looks fully bonded (like there's still some dry spots trying to flake off), turn it out of the bowl onto a lightly floured area of counter space. 4. Use your hands to press the dough together. If a significant amount of flour still refuses to join the mass, add a few more drops of water until you can convince it all to come together. As soon as it does, form the dough into a 4"x6" square and wrap it tightly in plastic wrap. Refrigerate for at least 30 minutes. 5. Place a small saucepan over medium heat. Combine all the filling ingredients and stir constantly with a rubber spatula until the chocolate bar begins to melt. Continue to stir until the entire mixture is a consistent texture, glossy and smooth. It should never be soupy, rather the texture of really thick hot fudge. Remove it from the heat and let it cool on the counter until it's not warm at all when you dip a finger in. 6. Preheat your oven to 400 degrees F. Remove the dough from the refrigerator and put back on your lightly floured countertop. You will have to add more flour to the counter as the dough absorbs some. Use a floured rolling pin to roll the dough out until it's about 12"x18" big or 1/8" thick. Imagine the space 8 pop tarts would take up - that big. Cut the dough into four equal rectangles. 7. Spoon a quarter of the chocolate filling into the bottom center of each dough rectangle. Dip your finger into your glass of cold water and trace the outline of the rectangle until it's shiny and slightly tacky. Fold the dough in half, on top of itself, and press your fingers around the four edges of your pop tart to shift the filling to the center. If the edges of your dough are really rough, use a knife to cut off the excess and make four clean edges. 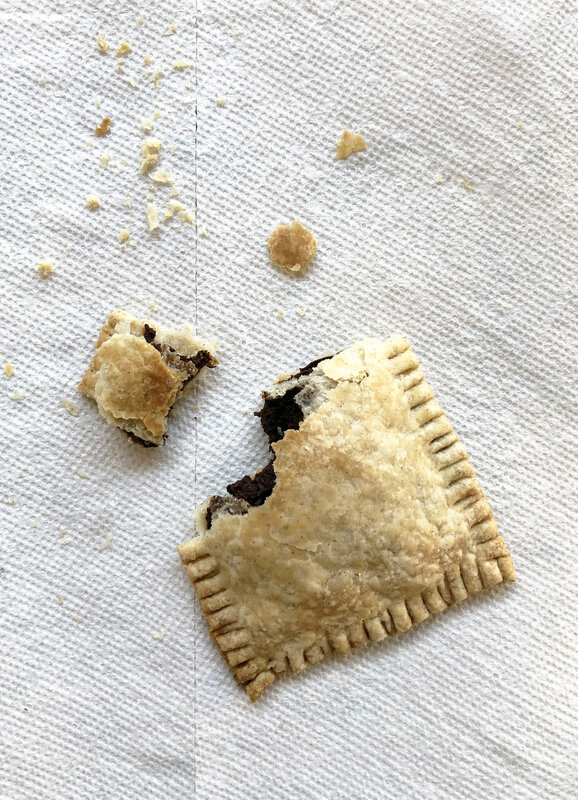 Use the tines of a fork to press firmly around each edge, sealing the pop tart closed. It's not a decorative thing, so press with confidence. 8. Place pop tarts on a greased baking sheet and bake for 12 minutes. Check on them then, they might not be fully done, so let them go a few minutes longer. The pie crust should be turning golden brown on the very top of the pocket and around the edges. Remove and let cool for at least 20 minutes before you dig in. That filling is HOT. 9. In the morning, set your oven broiler to HIGH and toast the pop tart for a couple of minutes. It's all cooked, so you're just reheating. Have fun. * If your children will find a coffee flavored chocolate filling totes disgusting, substitute instant coffee in the filling for cocoa powder. And then it's just chocolate. Raspberry Cream Cheese "Toaster Strudel"
1. Combine flour, salt and sugar in a medium mixing bowl. Whisk until blended. 2. Using a box grater on the largest grate (like what you'd use for cheddar cheese), grate the butter over a cutting board and use the paper wrapper to hold the stick and protect your hand. Add HALF of the grated butter to the dry mixture and toss with a fork until butter is evenly coated and incorporated. Grab a cereal bowl and toss the remaining butter with a bit of flour (so it doesn't stick together) and pop that in the freezer. 3. Add milk-water one tablespoon at a time, alternating dribbling water over mixture and stirring quickly with a fork. The mixture will ultimately be shaggy and dry-looking, but you don't want lots of flour at the bottom of your bowl that refuses to stick. I end up using about 4 tablespoons of liquid. Before the mixture looks fully bonded (like there's still some dry spots trying to flake off), turn it out of the bowl onto a lightly floured area of counter space. 4. Use your hands to press the dough together. If a significant amount of flour still refuses to join the mass, add a few more drops of liquid until you can convince it all to come together. As soon as it does, knead the dough twice. That means, like: flatten it out, fold it in half, press together, flatten it out, fold it in half, press together. Once it feels solidly like one whole of dough, roll it into a thick log (about the size of a LaCroix can), wrap it in plastic wrap and refrigerate. 5. Place a small saucepan over medium heat. Combine the whole raspberries, lemon juice and sugar. Use a fork or a whisk and all of the latent frustration you've serenely harbored to smash all the raspberries to a gooey pulp. Take it, berries. This will result in a soupy mixture. Let it bubble on medium-low heat for five to ten minutes, stirring occasionally and scraping down the edges of the saucepan. It will never be fully jam consistency while it's on the heat, so when the color has darkened and it seems to be thickening a bit, take a spoonful and blow on it until cool. Check if that's getting jammy or if it's still soup. Once you feel like you're getting close to jam consistency, remove the saucepan from the heat. Let it all sit for 5-10 more minutes. Then, stick your spoon in there and see if it's jam. If not, boil a bit longer. When it's done, let it cool completely. 6. To make the cream cheese frosting, dump the cream cheese in a small bowl and let it sit until softened. Add the wet ingredients and use a fork to carefully cut the liquid and cream cheese together until it looks like a clumpy mess. Then, add the powdered sugar and stir/whip with increasing gusto until it's all smooth and silky. 6. Preheat your oven to 425 degrees F. Remove the dough from the refrigerator and put back on your lightly floured countertop. (If you want a visual guide to this step, Bon Appetit has a great one here)You will have to add more flour to the counter as the dough absorbs some. Use a floured rolling pin to roll the dough out until it's about 6"x18" big or just a rectangle that is 3x taller than it is wide. Take your grated butter from the freezer. Sprinkle one quarter of the grated butter into the center of your rectangle. Fold the bottom third of the dough up to cover the butter. Spread another quarter of grated butter over this flap. Fold the top third of the dough down to cover the butter. It's like you're folding a business letter and sprinkling a little glitter under each fold because you are a monster. Turn this (now) square 90 degrees clockwise (it's important). Use your floured rolling pin to roll the dough back out to your 6"x18" rectangle. Do it all again: Place the third quarter of your grated butter into the center of your rectangle. Fold the bottom third of the dough up to cover the butter. Spread your final quarter of grated butter over this flap. Fold the top third of the dough down to cover the butter. Turn this square 90 degrees clockwise. Now repeat this step one more time without any additional butter. Roll the square out into your long rectangle. Fold the bottom third up to the center. Fold the top third down to make a square. Turn it 90 degrees. NOWWWWWWW: Roll the dough out to a 12"x18" rectangle about 1/4" thick (or the space 8 pop tarts would occupy). Throughout this process, the dough will absorb the flour on the counter and your rolling pin, so don't be shy about dusting everything over and over. Sticking is bad. No sticky. Cut the dough into four equal rectangles. 7. Spoon a dollop of raspberry jam into the bottom center of each rectangle. Take a spoon and add a strip of cream cheese frosting through the center of your jam (like you're making a three-striped flag of yummy goop). You will end up using about half of the frosting to fill all four pastries. Keep the leftovers. You may also have some leftover jam. Who is mad about it (not me). Dip your finger into your bowl of beaten egg and trace the outline of each rectangle until it's shiny and slightly tacky. Fold the rectangle in half, on top of itself, and press your fingers around the four edges of your pastry to shift the filling to the center. If the edges of your dough are really rough, use a knife to cut off the excess and make four clean edges. Use the tines of a fork to press firmly around each edge, sealing the pastry closed. It's not a decorative thing, so press with confidence. 8. Place pastries on a greased baking sheet and bake for 15 minutes. Check on them then, they might not be fully done, so let them go a few minutes longer. The pastry should be aggressively poofed and turning golden brown. Remove and let cool for at least 20 minutes before you dig in. That filling is HOT. 9. In the morning, set your oven broiler to HIGH and toast the pastry for a couple of minutes. It's all cooked, so you're just reheating. Before you eat a cooled one, spread some of that leftover cream cheese frosting on the top because you are a powerful human who deserves good things. Can I use store-bought pie crust? Can I use store-bought puff pastry dough? Can I use store-bought jam? Can I use store-bought cream cheese frosting? Can I use store-bought jarred fudge? So, in essence, could I do this with little to no work on my end at all? Like, really quickly? that's basically what I'm getting at.